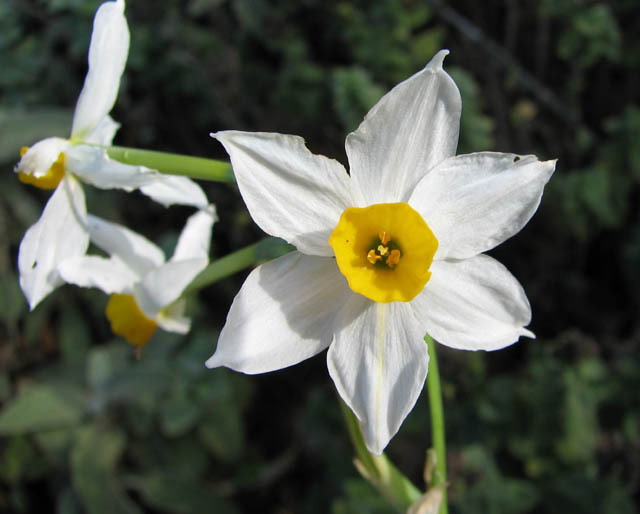 Unfortunately, the naming of species Narcissus is a mess. 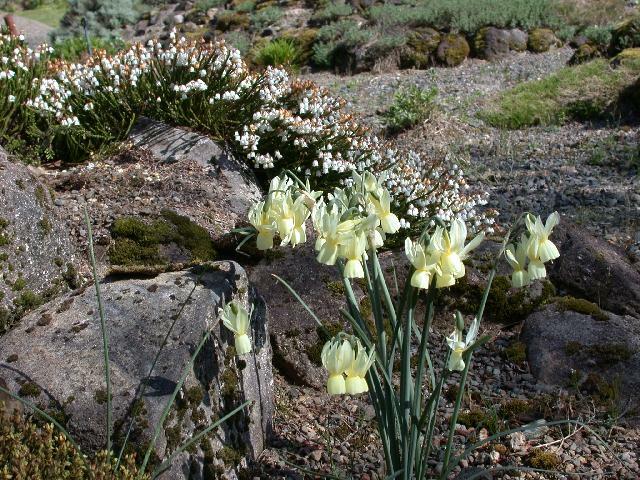 Bulb expert Brian Mathew reports that they can be difficult to classify, with various authors identifying anywhere from 26 species to more than 60. 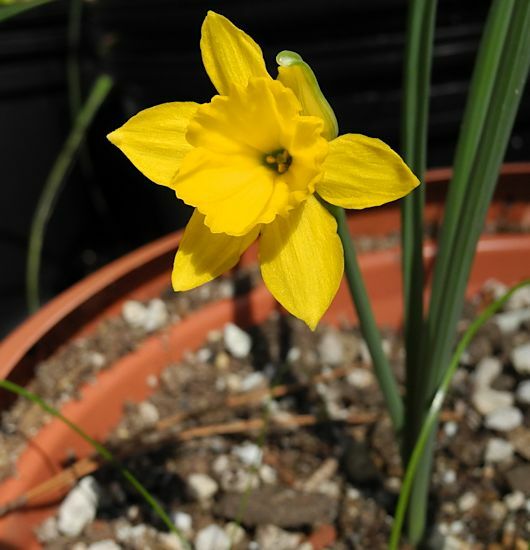 Because Narcissus have been in cultivation for so long, some plants believed to be species are known only in gardens, with no known wild populations to verify them. All of this confusion is reflected in commerce, where bulbs may be sold under a variety of different names. We've done our best to classify the following photos, but this page is definitely a work in progress. Please let us know if you find an error. The species Q-R will be found below. Narcissus radinganorum. 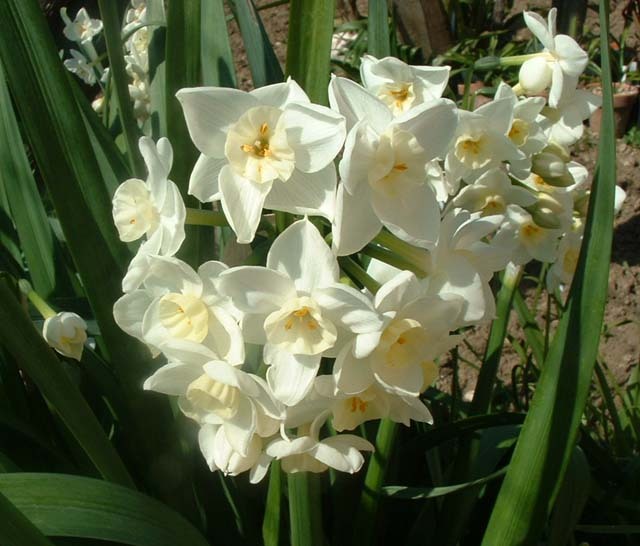 1b(B) - classic daffodils with large flowers. Similar to N. hispanicus. Southeast Spain. 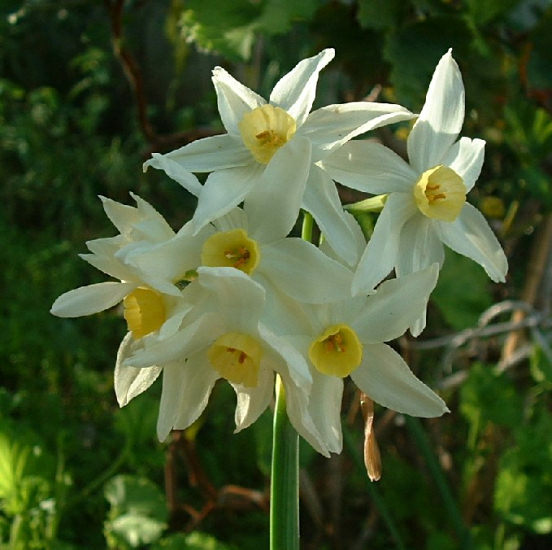 Narcissus romieuxii. see the Narcissus romieuxii page. Representative photos of this species by Arnold Trachtenberg and John Lonsdale. 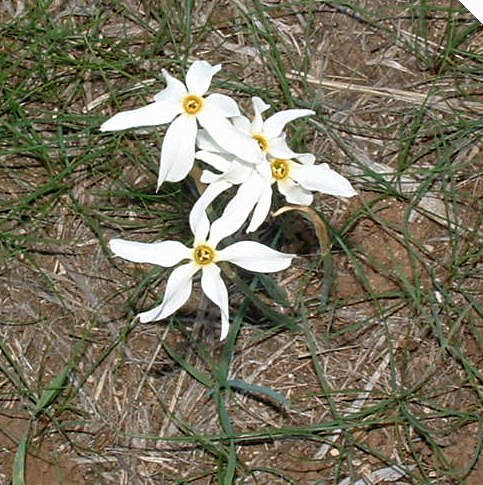 Narcissus rupicola ssp. rupicola. 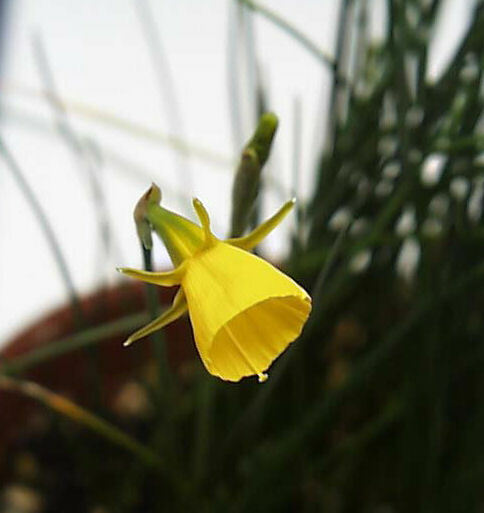 1d(ii) - This is a somewhat diminutive jonquil-type species mostly from Spain and Portugal, with subspecies native to the Atlas Mountains and Morocco. Apiculate imbricate tepals surround a conical flared cup. The cup has six crenate lobes and is sometimes almost flat. The six stamens are held in the constricted tube. 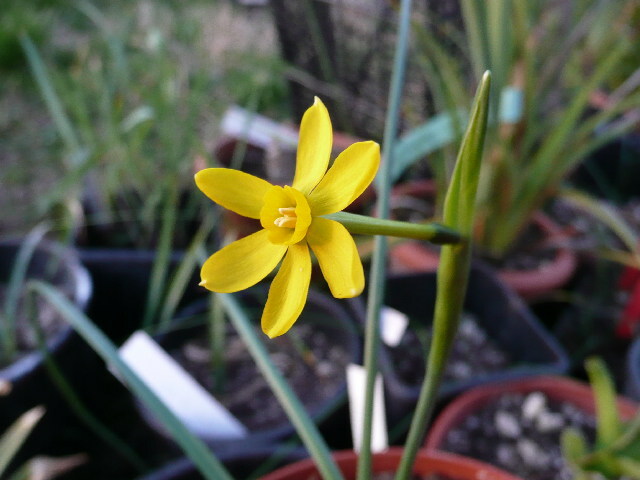 Narcissus rupicola ssp. marvieri has yellow flowers with a longer and broader corona than other subspecies. It is from North Africa (Morocco) and grows on well drained rock ledges and crevices. It is fragrant. Ian Young reported on his blog from the Scottish Rock Garden Society that it needs plenty of water as its leaves are growing, but dislikes being kept too wet for any length of time. 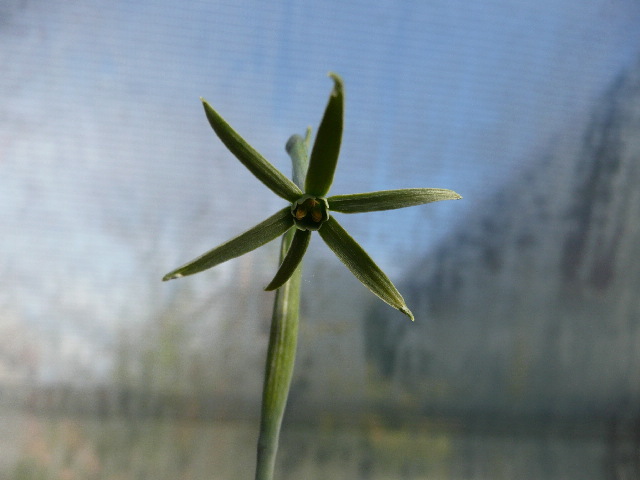 Photos from Mary Sue Ittner of a first bloom from seed. 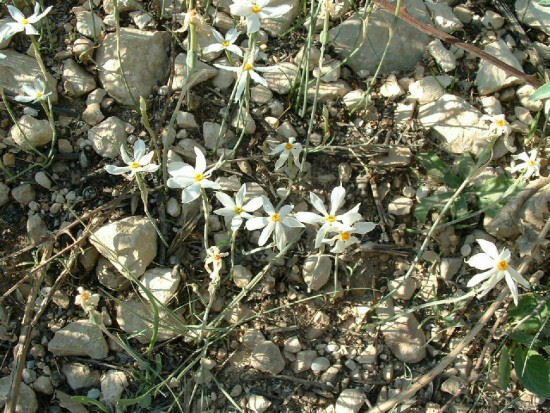 Narcissus rupicola ssp. watieri (syn. N. watieri) is a pure white flowered high altitude (8,000ft+) subspecies native to the High Atlas Mountains in Morocco on acid soil. It is the only pure white member of its section and has a greenish throat. It flowers a little before typical N. rupicola. 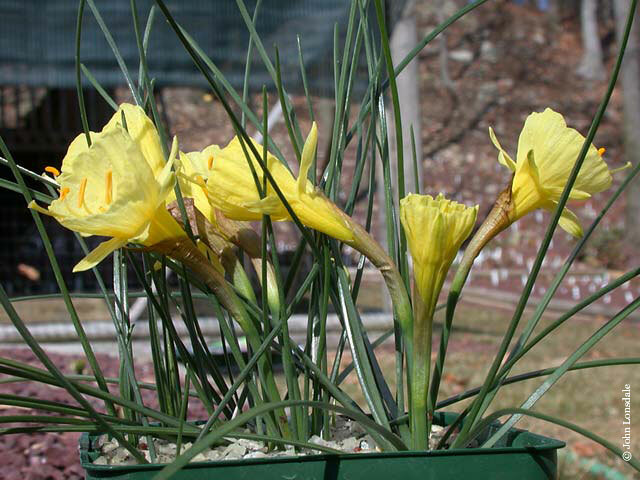 Hybridizers of miniature daffodils seek it, but it is well worth growing for its own sake, since it has exquisite form and increases moderately well. 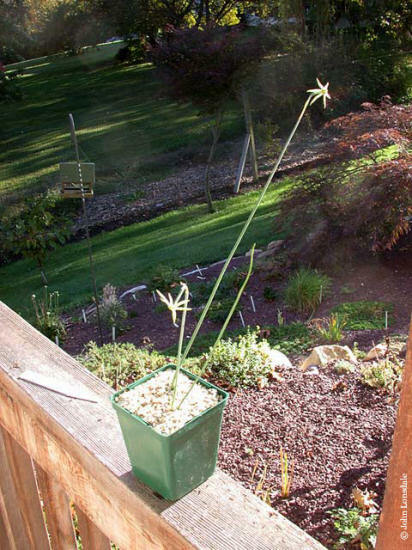 Shown flowering in a bulb frame in Oregon in March. Photo by Jane McGary. Narcissus scaberulus. 1d(ii) - This species is endemic to a small area in northern central Portugal. An estimated 10,000 individuals occupy an area just over an estimated 400 square miles. Flowers are yellow, less than three quarters of an inch in diameter. Perianth segments are slightly reflexed, truncate to acute at the tip, and incurved at the margins. 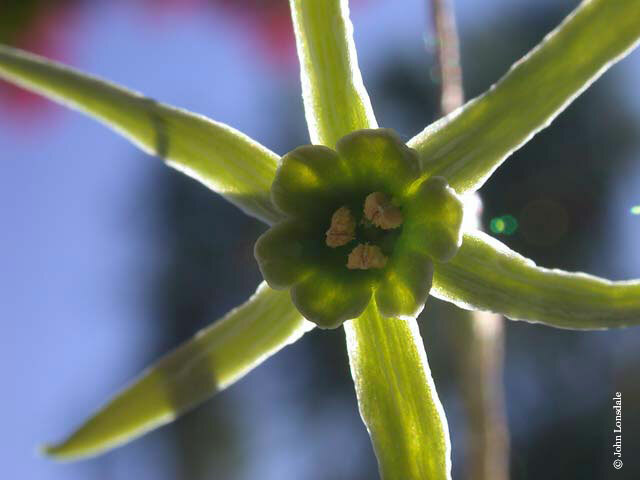 The corona is often more than half the width of the entire flower, cup shaped, often with a crenate margin. 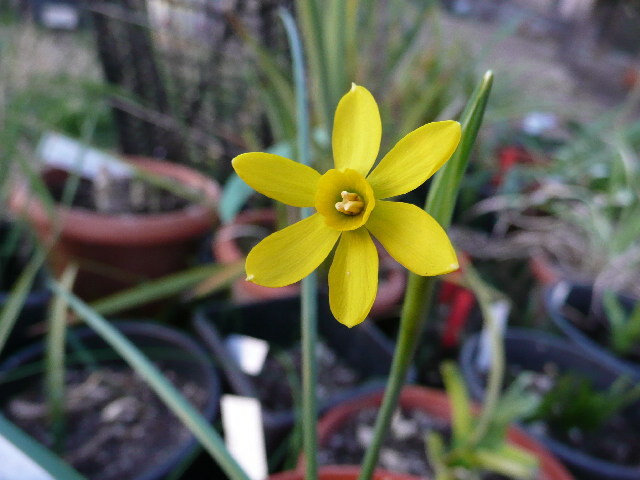 N. scaberulus grows up to ten inches tall, though usually shorter, with two to three flowers per umbel. It has prostrate or coiled leaves and one to three small flowers per umbel. Photos by Alessandro Marinello. Narcissus serotinus. 2a(iii). N. serotinus is a white flowered Autumn flowering species native to much of Mediterranean coast, including islands, and coastal Morocco. It has also been reported as extending inland to southeastern Portugal and southwestern Spain. Reaching a height of five inches, the flowers are characterized by bright white, cuspidate, sometimes twisted or slightly reflexed tepals and a minuscule dark orange cup less than a tenth of an inch wide. 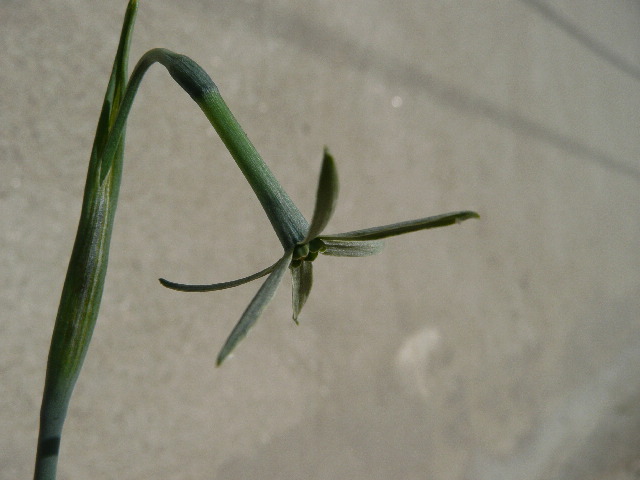 The leaves appear after flowering. N. serotinus is sweetly scented and blooms in the vicinity of other Autumnal geophytes such as Colchicum filifolium, Prospero autumnale, and N. cavanillesii. Mathew noted that some botanists have identified varieties in this species, but he said they are doubtful. Usually carries one flower but sometimes two, or even three. Photos taken in habitat by Angelo Porcelli in Apulia - Italy. Narcissus tazetta 2a(i)A - colored tazetta-like flowers. Up to 15 fragrant flowers in an umbel. Petals are white, and the corona orange or yellow. This species has naturalized from Europe to Asia. This is one of the better known flowers from the Mediterranean. Much loved for its sweet scent, it has been cultivated for centuries and spread around the world. A countless number of hybrids exist. This is one of the wild fertile forms found in Italy. Photo #1 in habitat by Angelo Porcelli. The next photo, by Jane McGary, shows wild plants of N. tazetta on the island of Marathonisi (ancient Krinai) off Gytheion in the Peloponnese, flowering at the end of October. Plants on Crete typically flower in early spring, however. Photos #3-4 were taken by Nhu Nguyen at the UC Botanical Garden. The plant material pictured came from Israel. Photo #5 shows wild collected fertile forms in Italy by Angelo Porcelli. All them have smaller florets than orientalis and italicus and they also have different scents. Photo #6 was taken by Mary Sue Ittner and identified as this species. The photo below shows the double form of N. tazetta called 'Double Roman' or 'Constantinople'. In spite of those who consider these two separate forms, being one totally double and the other semi-double, I found this is just a matter of feeding. All my plants regularly divided every other year and replanted in fresh soil, yield always a totally double floret with many florets per stem, while those neglected produce semidouble florets in lesser number and occasionally revert to the simple form. Photo and text by Angelo Porcelli. This is an old tazetta hybrid called 'Grand Primo'. 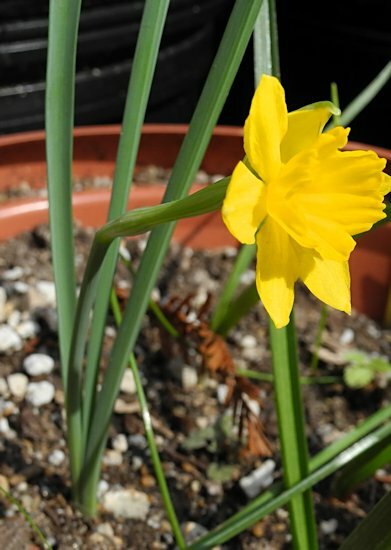 It is by far the stronger grower Narcissus for me, with bulbs that can reach 10 cm in diameter and often with two sturdy stalks per bulb. Photo by Angelo Porcelli. 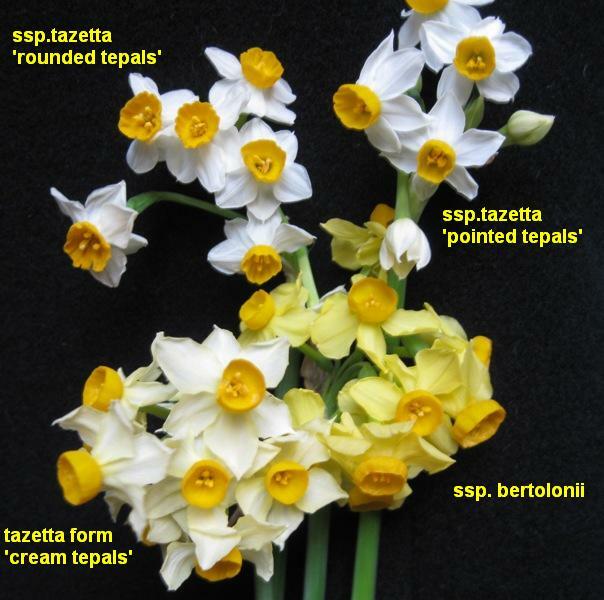 This is the so called "Narcissus tazetta italicus" which is actually a sterile hybrid between Narcissus tazetta and Narcissus papyraceus, found in Italy where the two species overlap. Note that N. papyraceus isn't an Italian native, but was introduced long ago and naturalized, especially along the coasts. William Welch reports this hybrid has been also named 'Stars' and 'Straw White', while Scott Ogden adds 'Minor Monarch' in his book. Photo by Angelo Porcelli. 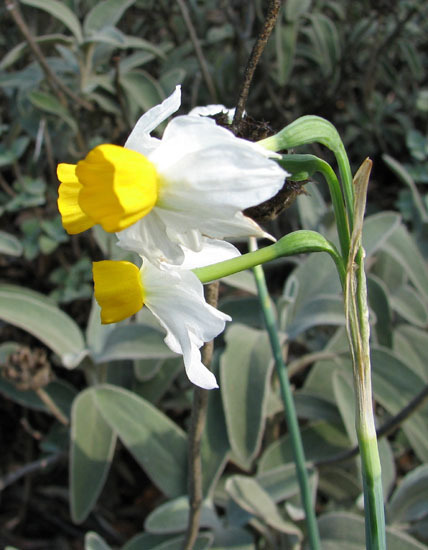 This is the so called Narcissus tazetta orientalis known also as the Chinese Sacred Lily. 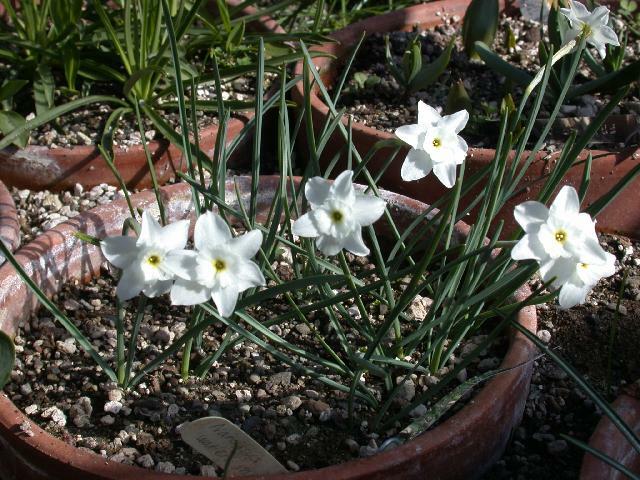 This form occasionally comes out spontaneously from Narcissus 'Constantinople'. 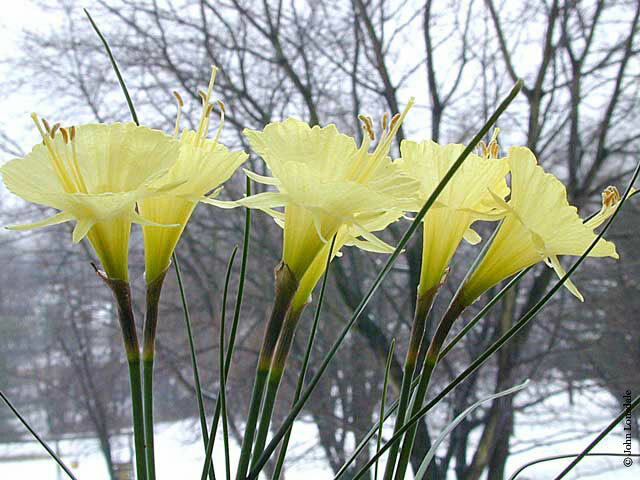 If the bulbs are picked and grown apart it will stay in the simple form, but after some years can revert to the double form again. It is a triploid form totally sterile and scattered in Southern Italy in all country gardens. It is thought to come from Portugal and Spain and spread to China along the Silk Route. It has a delicious scent, never unpleasant. Photo by Angelo Porcelli. 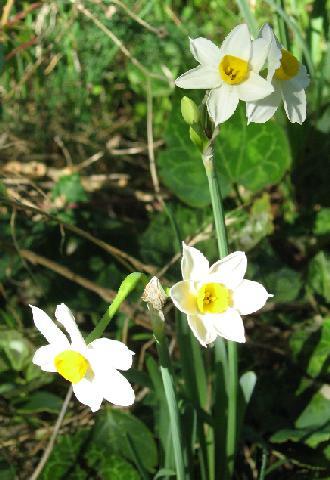 Narcissus tingitanus. 3 - the hoop petticoats, big conical coronas. Pale yellow flowers aging to white. Tangier. 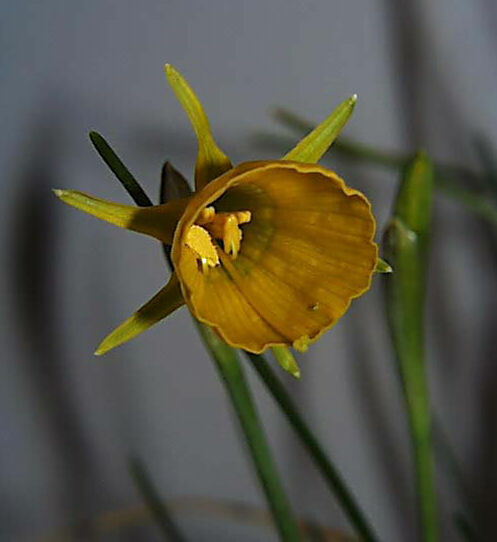 Narcissus tortifolius. 2a(i)B - white tazetta-like flowers. Gray-green, twisted leaves. Up to 16 flowers in an umbel. Spain. Narcissus tortuosus. 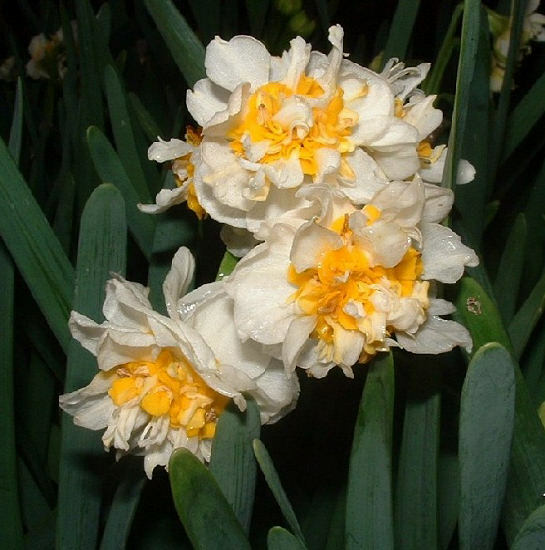 1b(B) - classic daffodils with large flowers. Yellow and white flowers, similar to N. moschatus. Spain. Narcissus triandrus. 1c - "angel's tears" daffodils. These drooping flowers have a rounded corona and swept-back petals, giving an overall look that's somewhat reminiscent of a miniature shuttlecock. They bloom in spring. Louise Beebe Wilder called them "a priceless gift from the Spanish Peninsula to the gardening world." This is either a species with several variants, or a group of several closely related species. Mathew classifies it as a single variable species. 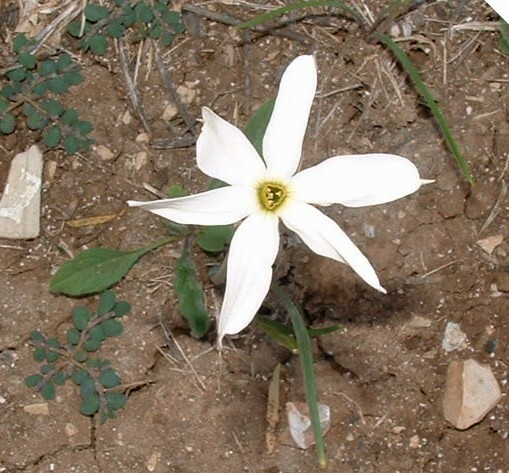 Usually represented in cultivation by the creamy white form shown in the photo. It is an adaptable plant (the one shown is growing on a peaty rock garden bed that is watered frequently in summer) and often self-sows in gardens. Photo by Jane McGary. 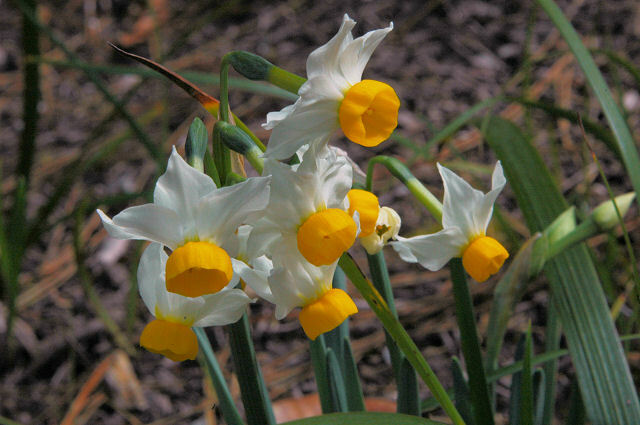 Narcissus triandrus var. cernuus. (syn. N. triandrus albus) Pale yellow or cream. Leaves about 2 mm wide. Spain and Portugal. 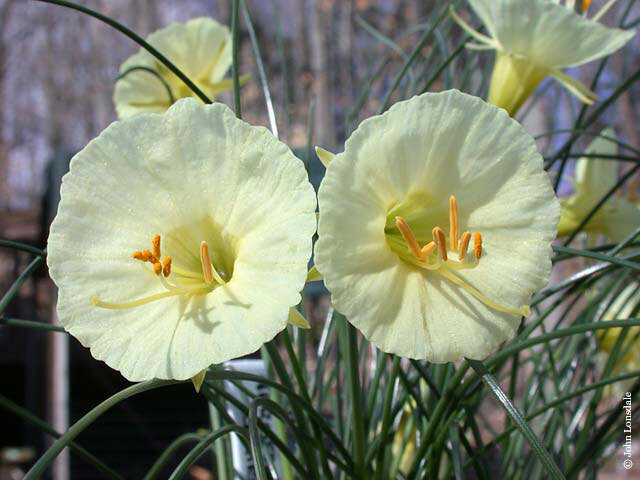 Narcissus triandrus var. concolor (syn. N. triandrus ssp. pallidulus , N. pallidulus, N. lusitanicus). Yellow flowers. Spain and Portugal. 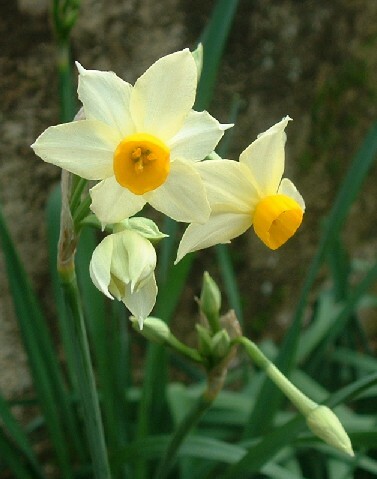 Narcissus triandrus var. loiseleurii (syn. N. triandrus ssp. capax) Like var. triandrus, but with white flowers. France. 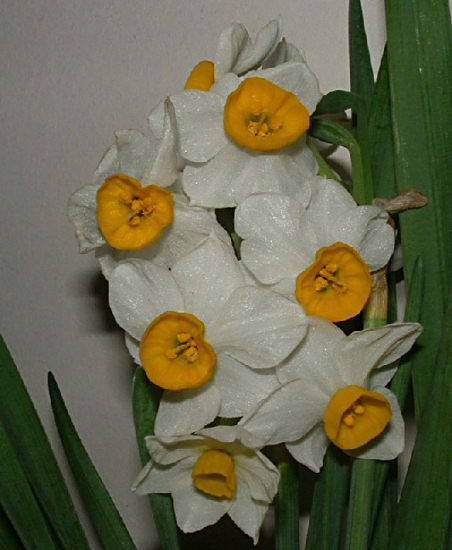 Narcissus triandrus var. triandrus. Pale yellow or white, leaves are 4–5 mm wide. Spain. Narcissus viridiflorus. 1d(iii). The green Narcissus. 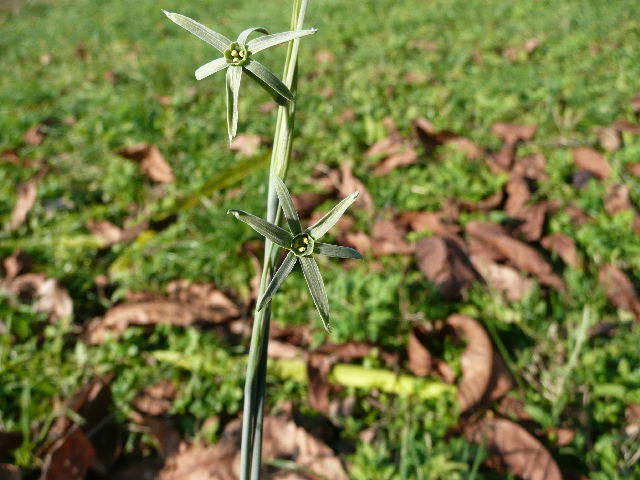 Strongly scented green flowers in fall, one to five in an umbel. Louise Beebe Wilder called it "a strange spidery, almost evil-looking flower." It is from Spain, Morocco, and Gibraltar where it grows in rocky places. 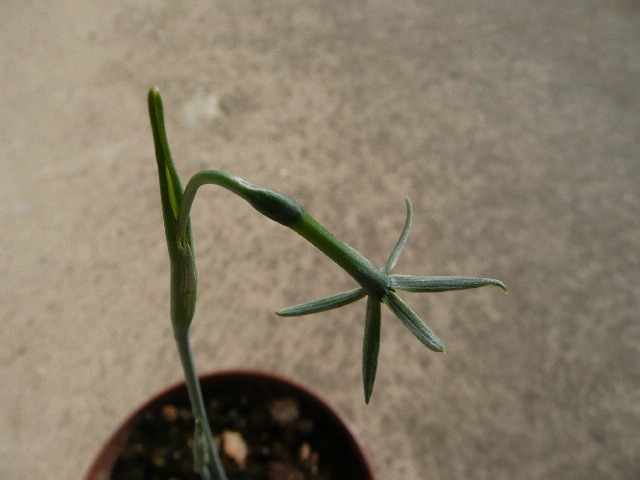 It needs a warm rest in order to flower. Photos by John Lonsdale and Alessandro Marinello. Narcissus willkommii. 1d(i) - green-leaved jonquils. Up to three flowers per umbel, straight tube. Spain and Portugal.